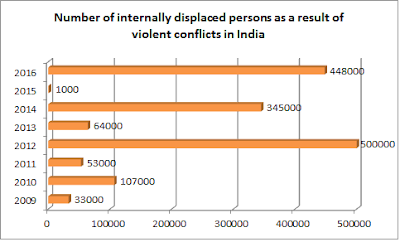 Estimating that a whopping 4.48 lakh people were displaced in India due to internal conflicts and violence in India last year, a new report, jointly prepared by the Internal Displacement Monitoring Centre (IDMC) and the Norwegian Refugee Council (NRC) has said that there are 7.96 internally displaced persons (IDPs) in the country. “In addition to the government’s indifference to the adverse impacts of displacement, extreme inequality in land ownership, insufficient implementation of laws and policies to protect indigenous lands, the power imbalance between project implementers and the affected communities, and the government’s severe approach to dissent are some of the key factors that enable and perpetuate displacement in the context of development projects”, the report states. India has witnessed a number of conflicts in the past couple of years,it is very important to distinguish between conflict induced IDPs and development induced IDPs. conflict induced IDPs are an invisible lot whom the government does not give any legitimacy.There are policies and schemes that take care of development induced IDPs and hence quantifying these IDPs is not an herculean task. India has had a long history of conflict and there has been displacement which is not even recorded, states like Gujarat have visible colonies of displaced persons, states like Assam, Telengana, Orissa who are often engulfed with conflict still do not have these colonies.. The phrase "conflict induced IDPs" is still a very alien concept to the government of India and this population does not lack of laws and polices will always keep these people in oblivion and their citizenship rights will continue be denied. The thrust has to be to formulate polices and measures to quantify this population, frame polices and schemes and make the government responsible towards this population. Conflicts which are state sponsored are hate crimes against humanity and the repercussions of these hate crimes leads to massive displacement. These need the attention of policy makers. Cases where the state is the perpetrator the government should ensure that no impunity is given to such states. Every other State and every other people are discussed. Somehow, Kashmir and Pundits remain invisible to the eyes of all analysts. No kind of ethnic cleansing covers them. They are never viewed as destitute deprived of their home and belongings. This is not to ignore or dilute the attention on the plight of other people. Any issue must be discussed without bias and prejudices. Lack of objectivity is what kills the credibility of platforms which do a good job in highlighting perspectives which do not figure in the mainstream, but overdo it to the exclusion of the mainstream. Mainstream and fringe are not mutually exclusive. They, together, constitute the composite whole.